This insanely creamy, earthy white bean mushroom soup is a remake of my Best Ever Mushroom Soup. It’s vegan, gluten free and ready in 30 minutes. This soup is easy enough for dinner any day of the week, heats up well the next day, so make extra for lunch, I guarantee you will still be thinking about it the next day. 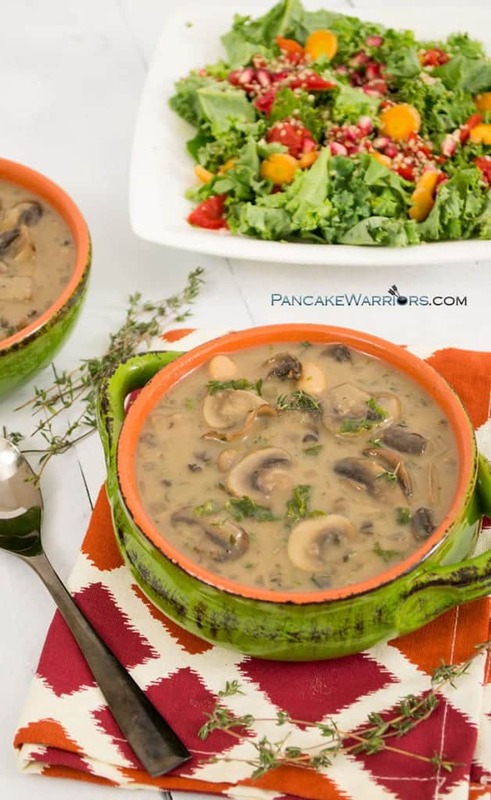 Enjoy this white bean mushroom soup with your favorite red wine and crusty garlic bread or salad for the ultimate Sunday Supper meal. 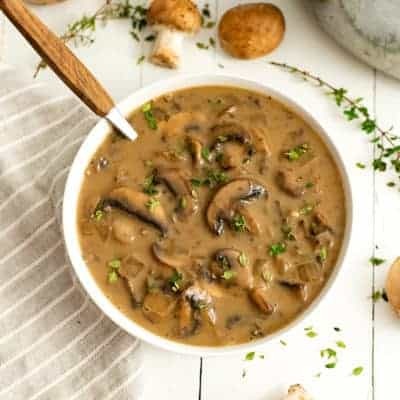 This recipe will change your mind about what mushroom soup is suppose to taste like, and it is easy enough to make that you should never have to buy the stuff in a can ever again. And after tasting this soup, you won’t want to! Why mess with a classic recipe? Well every time I make the Best Ever Mushroom Soup, I end up either eating the entire recipe in one sitting, or having to eat a sandwich or something else with the soup because although it’s delicious, I found myself hungry after just one serving. This is not too surprising since it’s essentially just mushrooms and stock. To add fiber and protein, I decided to add white kidney beans into the soup. Let me tell you the end product is an even creamier and richer soup. What’s the secret to an even creamier and richer soup white bean mushroom soup? I puree the white kidney beans in vegetable stock and add the pureed beans to the soup. The puree stirs right in and the soup instantly takes on a thicker texture. If you wanted a really thick soup, you could leave this on the stove to cook a bit longer to cook. But I love the flavor and texture right at the 30 minute mark. Seriously, you might not want to share this with family, ti’s that good! 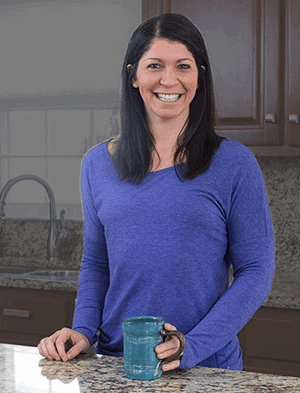 My focus when creating healthy recipes is to make them taste so good that you can’t even tell they are healthy. That’s the key to success when you are trying to help people gain new healthy habits that they can stick to long term. The best dishes are extremely nutritious but also satisfy cravings. 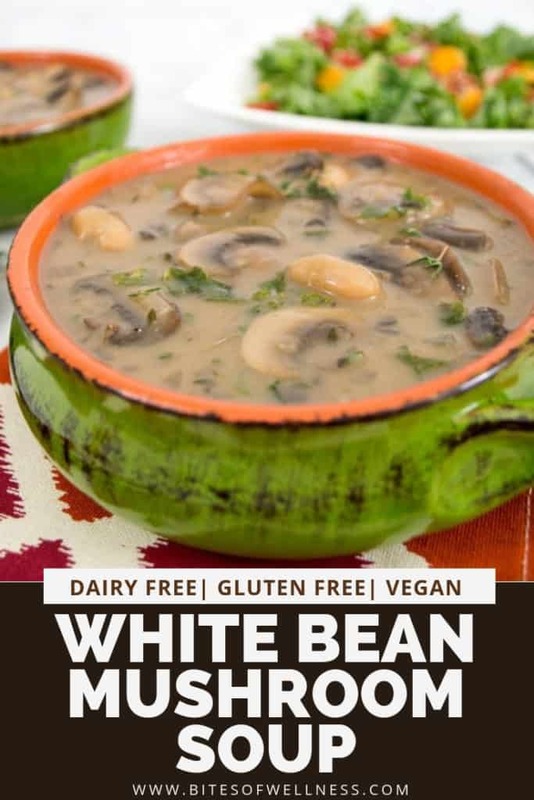 This best ever white bean mushroom soup has all the flavors needed to make the dish extraordinary, I just cut out all the added cream and fat from the traditional recipe. Knowing how to build flavors using stock, herbs and seasonings can get you far when learning how to cook healthy. Mushrooms and thyme are one of those go-to flavor combinations. Adding liquid aminos (or soy sauce or coconut aminos) helps bring out the meaty, earthy flavors of the mushrooms. 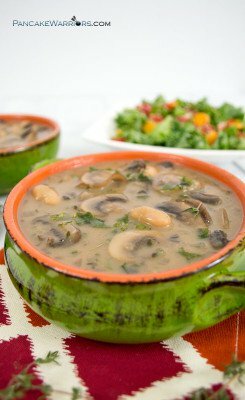 Seriously, try this white bean mushroom soup, I dare you to tell me it’s not the best ever! Mushrooms are cultivated in the dirt. Although most mushrooms now a day are very clean, if you find that your mushrooms are a bit dirty, use a damp paper towel to lightly brush off the dirt. Never run mushrooms under water. They are like little sponges and will absorb the water and ruin the texture of the mushroom. Mushrooms give off a lot of water when they cook, so using a big stock pot or large pot to fit all the mushrooms in the beginning. Don’t salt the mushrooms during the first 5 minutes of cooking. It keeps them from browning and the texture is never quite right. Thyme and mushrooms should always be together. They were made for each other. Seriously, this is a rule in my kitchen. Cutting mushrooms can be a bit of a chore, so if you want to buy pre-sliced mushrooms, just be sure they look fresh and there is no mold growing. When working with fresh thyme, the best way to get the leaves off the stalk it so hold the top of the stalk in one hand and use the other hand to gently pull down from top to bottom, collecting all the leaves. I do this directly over the mushrooms as they cook. Then just pinch off the top leaves and discard the stalks. 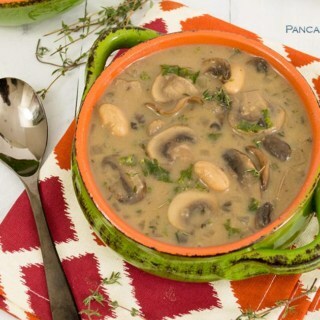 Creamy, rich and extremely flavorful, this white bean mushroom soup is the perfect dinner recipe. Ready in just 30 minutes, this filling soup is the perfect way to warm up on a cold night. Vegan, gluten free, low fat, high in fiber and protein. 10 oz package cremini baby portobello mushrooms - organic if possible. While onions are cooking, chop mushrooms. Move onion to the side of the pan after cooking 4 minutes. Add mushrooms and thyme leaves and allow to cook 5 minutes. .
After 5 minutes, stir in onions and add pinch of salt. You will notice there is starting to be a lot of water in the pot, this is good. Add the bay leaf and liquid aminos (or soy sauce or coconut aminos) and cook. 5 more minutes. 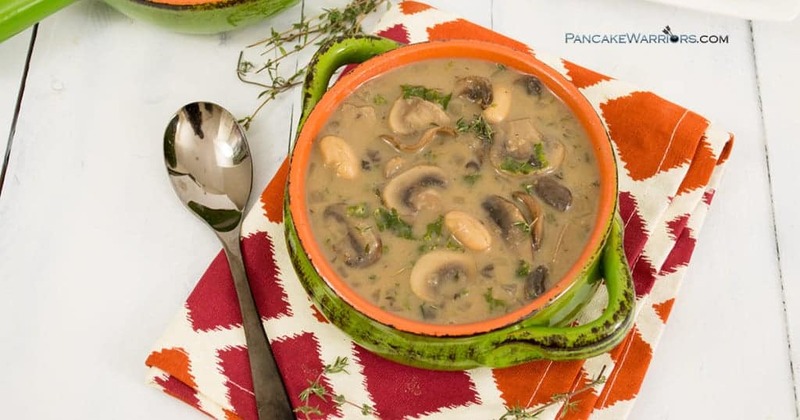 While the mushrooms are cooking, add tapioca flour to 1 cup of the organic vegetable broth. Stir well to combine. After mushrooms have cooked 5 minutes, add this and milk to the mushroom mixture and stir well. This needs to cook for about 15 minutes. While the soup is cooking, rinse and drain the white kidney beans. If you want to add more vitamins and minerals, chop the kale and add it now. After the 15 minutes is up, let the soup cool just a minute or two before serving hot! Have you ever made white bean mushroom soup before? What’s your favorite kitchen hack to add flavor to a dish? Delicious! I used button, cremini and baby portabello’s, canned coconut milk, fresh thyme, and followed the recipe. Unfortunately I missed the bay leaf, didn’t see it in the ingredient list. Everything else was included and I tripled the batch. The only change I made was using a kale mix that had carrots and red cabbage blended in. It was superb!!! I loved the inclusion of the white beans. I will definitely make this again. incredibly delicious!! even my finicky eater loved it. thank you for posting this recipe. I made this today. I noticed not to use vanilla almond milk too late. That’s all I had. Not sure if it affected it too much. The biggie was the fact that I didn’t have any crimine mushrooms, only white. Brown ones definantly have a lot more flavor. Had to use dried thyme instead of fresh so overall I didn’t follow the recipe very well. I had to add more soy and some Worcester sauce to get some flavor. Will try this again when I have the right stuff. Wasn’t that thrilled w the taste on this try. Why would you leave a rating if you changed the recipe that much? Of course you weren’t thrilled with the taste. You didn’t follow the directions. Made this last night. We loved it! I’ve been sick at home and recently heard Dr.Michael Greger (the author of the book How not to die) talk about the benefits of mushrooms, specifically button mushrooms, if you are suffering with upper respiratory symptoms. So, I searched my Pinterest boards for vegan mushroom soup recipes and came upon this one. Super delicious! I think my husband appreciated the added bulk the beans, blended and whole, added to the soup too as it was our meal. I’ll definitely make it again.